Fiction – Kindle edition; Atlantic Books; 368 pages; 2011. Last month I stated that I was going to read all the books shortlisted for the Kerry Group Irish Novel of the Year. 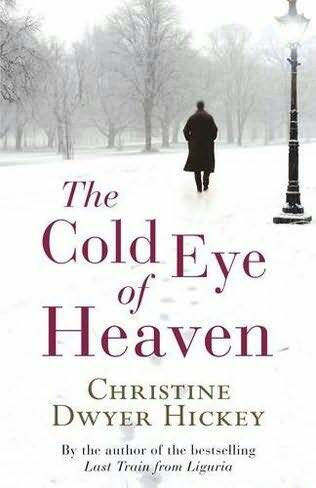 Christine Dwyer Hickey‘s The Cold Eye of Heaven, published last year, is one of the shortlisted titles. The book opens on 15 January 2010. Farley, an elderly gent who lives alone, has collapsed on the bathroom floor in the middle of the night, “one side of his face shoved into the linoleum, right shoulder pressed into the radiator”. As he lays there, trying to figure out how he got there and how he might be rescued, his mind starts wandering back to earlier times. We are then transported back to the previous day in which Farley traverses Dublin on various errands — taking his suit to the drycleaners, getting one of his shoes resoled, trying to find a priest to sign a mass card — all in preparation for the funeral of an old colleague, Slowey, with whom he had become estranged. From then on, the book tells Farley’s life story in reverse chronological order — in 10-year increments — right back to his early childhood in 1940. Along the way we find out about his relationship with Slowey — the pair were in business together as law clerks, but they were also related by marriage — and discover how things fell apart between them. We learn about his marriage to Martina, a raven-haired beauty, who died from cancer very young, and how he never quite recovered from her death. And we learn of an adulterous relationship he began some time afterwards that created terrible repercussions from which he could never quite escape. There is also a heartbreaking chapter in which he must look after his senile mother, who often mistakes him for her lover. What emerges is a very human portrait of a complex individual leading an ordinary life, often in extraordinary times. As well as being a lovely, poignant and often humorous tale of one man’s life, it is also a brilliant portrait of Dublin through the ages — before and after the Celtic Tiger. The second chapter is especially evocative of the streets and pubs and churches, and in Farley’s attempt to attend a funeral, there’s a very strong nod to James Joyce’s Ulysses. Dwyer Hickey is particularly good at detail — an elderly Farley making his way gingerly across a snowy garden path is like “a half-pissed tightrope walker”, a neighbour has a “face bulged from the cold and there’s a jellied, goitred look about her eyes”, a stationary bus is “farting out a long bloom of fumes” — and she deftly balances a full gamut of emotions — sadness, grief, disappointment, joy and happiness — so that nothing feels cloying or tacked on. My only quibble is that the younger Farley is far less interesting (and wicked) than the older version, so as the book gets closer to the end (and Farley’s beginning) the narrative runs a little out of steam. But in exploring the full arc of one man’s life from grave to cradle, Dwyer Hickey is able to explore many themes, in particular what it is to get old, but also how love, betrayal and heartbreak can shape one’s outlook. Her acute insights into the inner-most workings of the human heart, mind and soul make The Cold Eye of Heaven a rich, warm and humane novel.